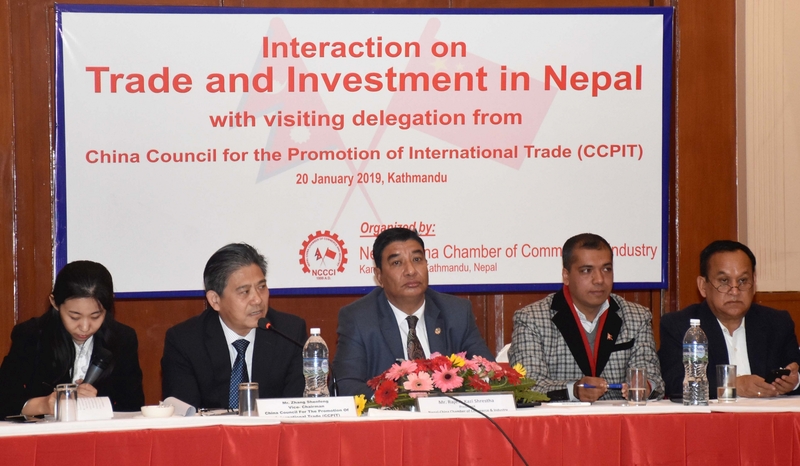 Representatives of Nepal-China Chamber of Commerce and Industry and a delegation of China Council for the Promotion of International Trade (CCPIT) Headquarters held an interaction on Trade and Investment in Nepal on Sunday. A 30-member delegation led by Vice-president of CCPIT Zhang Shenfeng arrived in Kathmandu for exchanging information about the investment situation and projects in Nepal. The CCPIT and NCCCI had signed a Memorandum of Understanding (MoU) in 2009 to promote trade and commerce and by participating in seminars, workshops and other events organized in both the countries. Speaking at the event, president of NCCCI Rajesh Kazi Shrestha urged the Chinese investors to invest in Nepal as investment climate has improved in Nepal with the formation of a stable government. Stating that Nepal, as a least developing country, would receive the facilities in international trade, he asked the investors to take advantage of the facilities by increasing their export by establishing manufacturing and other industries in Nepal. "Tourism, agriculture, water resources and infrastructure sectors are potential areas of investment in Nepal," Shrestha informed. Zhang said that they would work in Nepal for the development of railway, banking, airlines and tourism. Stating that many members of the delegation have already invested in Nepal, he said that other members of the delegation also wanted to invest in Nepal. The delegation comprised the investors of the railway, technology, telecommunication, construction, agriculture and engineering sectors, he added.